WASHINGTON -- South Korea and the US have agreed to seek a “comprehensive, phased approach” to denuclearize North Korea, President Moon Jae-in said, while his US counterpart Donald Trump said the two agreed on a “fair and more reciprocal” economic partnership, after their first summit talks, Friday in Washington. 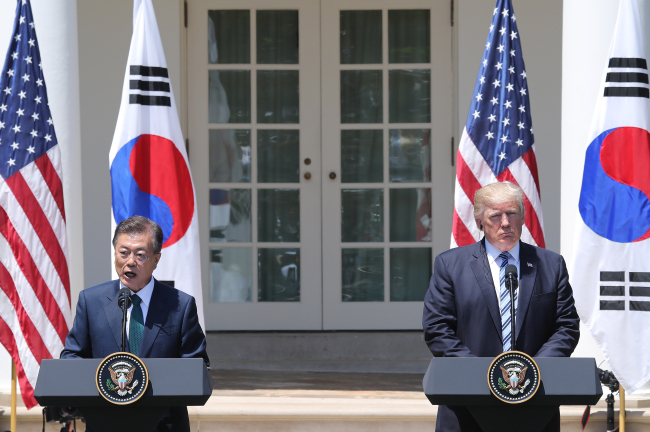 As he did in the run-up to the summit, Moon focused on the alliance and security issues in the joint press briefing, saying he and Trump agreed that security was key to realizing true peace and to raise pressure on North Korea. 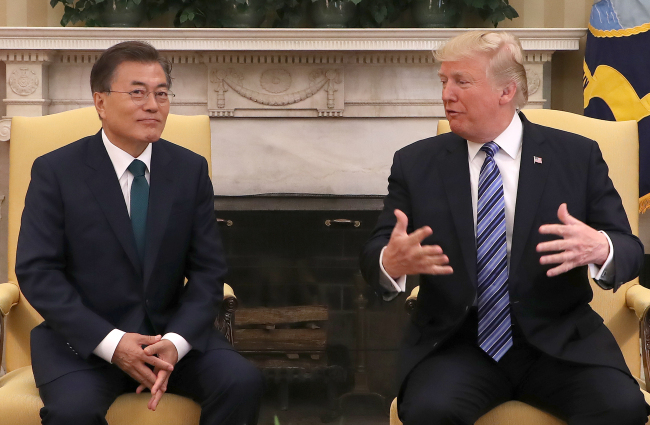 “(Seoul and Washington) will work closely together in policies, with resolving the North Korean nuclear issue as the top priority,” Moon said. “North Korea should not underestimate the firm resolve of South Korea and the US,” Moon said, calling on Pyongyang to return to the negotiation table. Trump, meanwhile, said, “Strategic patience ... has failed. Frankly, that patience is over,” adding that North Korea’s nuclear and ballistic missile programs require a determined response. Moon also said that Seoul will strengthen its defense capabilities, while at the same time increasing the capabilities of the alliance. Moon touched on economic issues as well, saying the two countries will work toward reciprocal results. “The Korea-US alliance will be developed and expanded as global partners. The two countries will establish high-level negotiation bodies in diverse areas,” Moon said, before going on to offer his condolences over Otto Warmbier’s death and ensure the two nations would work to prevent a repeat of such tragedy. Moon also revealed that Trump had accepted his invitation to make a state visit to South Korea within the year. Trade, however, stole the spotlight with much of Trump’s statement focusing on related issues. “We are renegotiating a trade deal right now with South Korea, and hopefully it will be an equitable deal. It will be a fair deal for both parties. It’s been a rough deal for the US, but I think that it will be much different and will be good for both parties,” Trump was quoted as saying by foreign media. At the joint press briefing that followed the meeting, Trump said that Seoul and Washington are working on trade issues and that the result would be a positive deal for both countries. Trump also said he was reassured by Moon’s promise to work on creating a “level playing field” for US industries, particularly for the automotive industry. Trump has often attacked the Korea-US Free Trade Agreement, referring to it as a “horrible” deal and a “disaster” that his administration hopes to renegotiate, or go as far as abolish entirely. Trump had tweeted beforehand that “a new trade deal” was among the topics of his conversation with Moon during the welcoming dinner hosted by the White House on Thursday. The tweet prompted speculations the Korea-US FTA would be go on the operating table. Cheong Wa Dae officials, however, declined to elaborate on the comment. Although Seoul did not reveal information on trade issues ahead of the summit meeting, the South Korean present had hinted his administration would be open to discussions. According to the US Census Bureau, the country’s trade deficit in goods with South Korea grew from $16.6 billion in 2012 to $27.7 billion in 2016. Data from the Korea International Trade Association put the increase at from $15.2 billion to $23.2 billion for the same period. Seoul argues steel and automobiles are a small fraction of the two-way trade, and it has been seeking to increase energy imports and investment in the US. The US also has a trade surplus in services, which amounted to $10.7 billion in 2016, up about 2.6 percent from a year earlier, according to the Office of the United States Trade Representative. The country now accounts for around 10.6 percent of South Korean imports, up from 8.5 percent in 2011. South Korean businesses invested more than $22.7 million in the US from 2012 to 2015, whereas US investments in South Korea stood at $16.3 million, KITA figures show. Regarding the significance of the summit on the level of personal relations, both leaders gave positive assessments. “It was a great opportunity for us to further the trust and friendship between myself and President Trump,” Moon said.